Evidence is rapidly mounting that significant climate cooling has begun. While a deep freeze like an ice age may be centuries away, the beginnings of the predictable descent to much cooler (and deadlier) climate are likely to be felt in cool trends spanning decades. The current solar minimum arrives at a point in the changing orbital configuration of Earth that coincides with rapid and deep cooling of 400,000 years ago. As the likelihood of rapid and significant global cooling due to changing orbital and solar cycles is supported by recent sharp ocean and atmospheric cooling, Congress continues to march against the tide of reality but in step with the drumbeat of extremist environmentalists who demonstrate little comprehension of either scientific reality or the damage their policy demands will inflict on the US standard of living. Apparently, the US Congress is no more restrained by scientific reality than it is by Constitutional limitations to its power. This "Imperial" Congress is hard at work plotting a course that will drive the US standard of living backward by centuries at a cost that will dwarf unconstitutional spending excesses of the past 70 years (under Democrat Congresses of FDR, Reagan, and now Bush II). All for not one whit of environmental benefit. Both science and historical precedence now inform us that the premise that climate warming is bad for human civilization is completely contrary to reality. Warmer climate has always produced longer growing seasons and greater arable land area, less political turmoil (war), less starvation and famine, less disease, and greater advances for mankind. Nevertheless, led by a false prophet and "cooked science books" by a political organization (the UN's IPCC), politicians who never seem to pass up an opportunity to exert greater control over other people's lives are working diligently to "control" mythical human-caused "global warming". Ironically, this effort comes when substantial evidence from real scientific inquiry informs us both that human activity is incapable of seriously impacting climate and that Earth is on the precipice of (and has likely just taken the initial step into) a new ice age -- a period of rapidly declining global temperatures and rapidly increasing snow and ice cover, particularly in the Northern Hemisphere. Nevertheless, those scientists who've sold out for a piece of the multi-billion dollar government grant pie, continue to produce distorted "papers" that serve to bolster the propaganda campaign pervasive in media, education, environmental, Congressional, and government scientist circles. This campaign is designed to use worst case scenarios based on flawed computer simulations of poorly understood climate science to alarm the public and convince people that humans are causing significant climate change ("global warming") that can only be curbed by restricting CO2 emissions. This grand hoax, unsupported by any verified methodology or analytical process, relies on false premises and faulty processes to paint a picture of catastrophic danger resulting from human activity. The sad truth is that there is absolutely no credible scientific evidence that atmospheric CO2 has ever caused significant climate change on Earth from any source. While it is true that atmospheric CO2 is a greenhouse gas and helps retain heat (though the vast portion of heat retention is due to water vapor and clouds, not CO2), there is a significant distinction between being a heat retention "greenhouse gas" and a significant force for altering climate. The historical climate record reveals that most of Earth's history has witnessed atmospheric CO2 at levels much higher than today's. You wouldn't know that from those who beat the drums of "global warming". There was never any "runaway" greenhouse effect, despite atmospheric CO2 levels that were more than tenfold higher than today's levels! In fact, many of the very high atmospheric CO2 periods coincided with some of the coldest climate episodes in Earth's history. We now know that atmospheric CO2 responds to temperature change; it does not cause temperature change. Al Gore was aware of that fact when he made his propaganda film, An Inconvenient Truth. Despite that knowledge, Gore deliberately misrepresented data in such a way that his audience was led to erroneously believe that CO2 was responsible for warming climate, not the reverse. The CO2-temperature relationship is easily understood in context with the role that oceans (covering 70% of Earth's surface) play in both sequestering and releasing CO2 from and to the atmosphere as temperatures fluctuate over time. Warming climate drives CO2 out of the oceans; cooling climate allows oceans to absorb more CO2. It's as fundamental as that. The chart below clearly reveals the cyclic nature of climate warming and cooling over the past million years that was first proposed by Milutin Milankovitch more than 60 years ago. 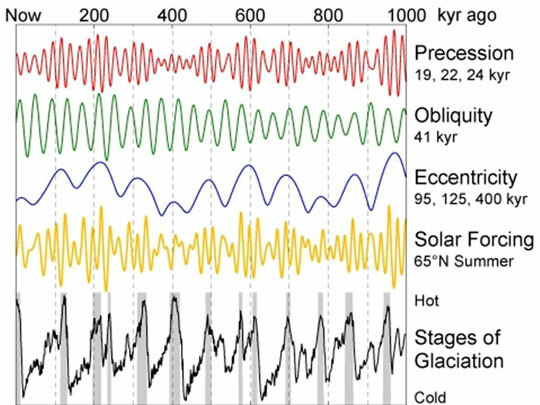 Known as the "Milankovitch Cycles", these periods of natural orbital and solar deviations are the primary drivers of significant climate change. This chart was prepared for a study by mathematicians Quinn, et al, titled, "A 3-Million Year Integration of Earth's Orbit" published in The Astronomical Journal 101, pages 2287-2305, June 1991. Note that today is at the very left side of the chart. Gray areas cover peaks of global temperature variations that identify interglacial periods of relatively warm climate typical of what humans have experienced over the past several thousand years. Ice ages are represented by the valleys between peaks of gray areas. Ice age climate would truly be "catastrophic" to humans. The top three curves show the Milankovitch cycles of Earth's orbital changes due to precession and obliquity of polar axes, and eccentricity of orbit. The forth curve shows changes in solar forcing (solar variability), likely due to solar activity/sunspot/magnetic flux cycles. Finally, the bottom curve shows temperature changes as a consquence of these other influences. It is instructive to compare the behavior of all these curves around 400,000 years ago with the curves as of today. There is an eerie similarity to the confluence of all of these curves and the resultant change in the climate chart. Looking at 400,000 years, the rapid decline in global temperatures was just beginning when the other four charts were in periods of change very much the same as what is being seen today. If the past is any indication of the future, rapid and significant global cooling is virtually a certainty in the near future if it has not already begun. Of note is the fact that his past winter was characterized in the northern hemisphere by snow cover extent and persistence not seen for more than 40 years. This, on the heel of 12 months of cold global temperatures not seen in many decades (in both northern and southern hemispheres) that gave up nearly all (about 1�C) of the total warming of the past 100 years! Meanwhile, back in Washington, DC, politicians with blinders fully in place and ignorant of real climate science work diligently to plot a decline in your standard of living to levels not seen in the past several hundred years. Remember, these are the very same politicians who, while funding grants to environmental groups and taking political contributions in return, prohibit oil companies from exploiting vast known domestic oil deposits offshore and in the bleak frozen landscape of northern Alaska. Then when oil prices go up sharply and profits of oil companies increase accordingly, our Imperial Congress has the hubris to call oil executives "on the carpet" and berate them for simply following the dicatates of economic laws of supply and demand. All it would take to drive down oil prices would be for the Imperial Congress to enable oil companies to extract the known oil deposits the US has and to allow new refineries to be built. But far-Left psuedo-environmentalists (more interested in destroying capitalism than saving the environment from mythical dangers) use political contributions to wield undue influence over corrupt politicians with the consequence that the average American is hit with ever higher costs of living and threats of regulations that will severely erode standards of living. Anyone who votes for an incumbent this fall is simply part of the problem. The only cure is to rid our nation of professional politicians whose first concern is their own well-being (i.e., re-election) and to continue the practice of never voting for an incumbent. Battles for succession should be waged in primaries to avoid either having to vote for a member of a different party or simply not voting. Meanwhile, stock up on incandescent lightbulbs (CFLs don't work too well in bitter cold) and prepare for a siege of cold climate beyond anything humans have experienced since the Little Ice Age.